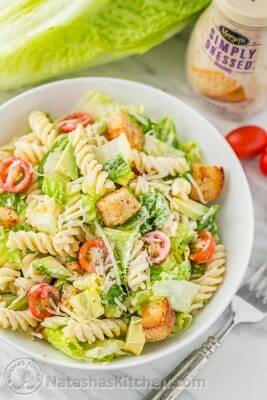 This Caesar Pasta Salad is scrumptious and makes for an easy weeknight family meal. It has all the creamy goodness of a classic caesar salad, but more exciting with pasta and avocado. Cook pasta in salted water according to package instructions until al dente. Rinse in cold water and set aside to drain. Rinse, chop and spin the romaine lettuce dry using a salad spinner. If you don't have a salad spinner, pat dry with a clean towel. The dressing will coat the salad much better if the lettuce isn't wet. Transfer lettuce to a large mixing bowl. Toss in the diced avocado and halved tomatoes. Add the Caesar Dressing to really boost the flavor of this salad. Toss to evenly coat the lettuce. Add the dressing to taste. Sprinkle with parmesan and croutons.